We finally hit the first day of spring and summer is coming fast! The warmer weather and sunshine might sound great, but they can bring with them a challenge if you run a mom blog--writer's block. The kids are home, schedules are thrown off, and it's easy to let your blog fade into the background. This isn’t what you want when you are trying to grow a blogging business! So, below are 42 blog posts ideas to get your wheels turning. And, if you keep scrolling I'm going to share some more on why it's so critical for your business to start planning right now. Why plan summer blog post topic ideas early? I get that you might not "feel" ready to talk about summer content. But, if you want to run a successful blogging business, you need to be thinking about what you're going to be writing about well in advance. And, this becomes even more important when there are extra things in the mix like vacations and holidays. Here's why early planning matters. Let's say you want to post a recipe for a Super Bowl snack. If you wait until the day of the Super Bowl to share it then most people already have their plans made. If you want readers to find and use your recipe you need to share it well in advance of game day. If you put it out there early it gives them time to find it before they make their menu and head to the store. It works the same way with your content for your mom blog. It's going to be easier to plan before summer actually starts. And, it's going to give you more time to get your content out there and draw attention to it. Wouldn't it be great if you could get your summer themed blog posts into roundups from other bloggers? Well, it's not going to happen if you're late to the game. Let me step back for just a moment. Maybe you're new to this whole idea and are wondering how to even start a blog. It's not as hard as you might think to start a blog. But, if you want to run a successful blogging business, you do need to have some strategy regarding what you do. What can I blog about to make money? There are people making money blogging about just about any topic that you can think of. That's the beauty of blogging! When you blog, your content can reach anyone on the internet all over the world. It no longer matters if you have others in your city that have a similar interest as you because you can find those like-minded folks online. Do you feel like every idea is already taken? Don't worry! 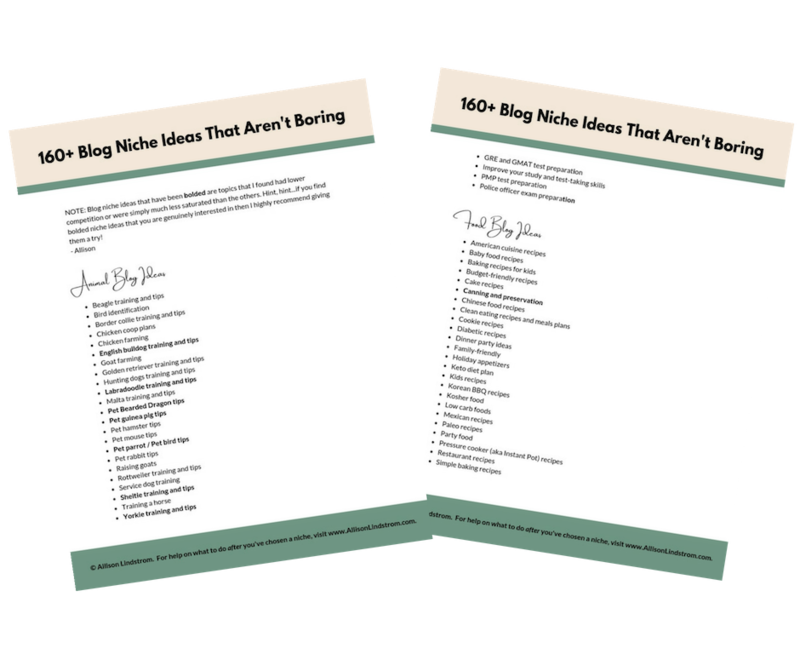 You will be putting your own spin and personality into whatever it is that you blog about. And, since you are uniquely you, your blog will be unique as well. Now, does that mean just choose anything and start writing? Not really. You will also want to choose an area to focus on. Instead of being a "mommy blogger" maybe you focus more on being a mommy blogger that blogs about being a mom of a child with sensory processing disorder or a mom of multiples or [fill in the blank with your own experience]. How do I become a mom blogger? How do I start a parenting blog? Before you worry about coming up with blog post ideas for mommy bloggers, you'll need to get yourself set up with a blog. The main things you need to get started are a domain name and hosting. You can learn more about your options in my blog post, How to Start a Blog So You Can Work From Home. Once you have your blog set up you need to start filling it with mommy blog posts and content that will benefit your target audience. Remember: Instead of focusing just on what you want to write about, make sure you think about what your audience wants to read about. The more value you provide for them, the easier it will be to keep them coming back for more. The good news is, as a mom, you can use your own personal experience. Think about what topics you are interested in as a mom and start there. If you are new to blogging the next question you probably have is, "How much is this going to cost me?" I get it! I'm a pretty frugal person so I totally understand where you're coming from. Money can be tight when first starting a blog, especially as a parent. There are plenty of things fighting for your finances. If you just want to get your feet wet and see if this blogging thing is for you then you can always start as a hobby blogger. You can simply sign up on a free platform (I give you some great options on where you can blog for free here) and start typing away. However, if you decide that you love this job and you want to make money blogging, then it's time to get serious. You will need to invest some money into your blog from the start. But, the good news is you can get started without making a huge investment. You can find out more about how much it costs to start a blog in my post: Start a Blog - How Much Money Does it Take? Are you looking for summer ideas for another blogging niche? I wanted to give you some blog post ideas to make your planning easier for you. These ideas are really just for mommy bloggers. But, if you're another kind of blogger and would love to see a post like this in your niche then leave a comment and let me know. Or, you can hop on over to my YouTube channel, subscribe, and leave a note for me there. Summer will be here before you know it. Think how good it will feel to be ahead of the game by having your content ready to go! You can also sign up for my free blogging course to learn more about what it takes to run a blogging business.